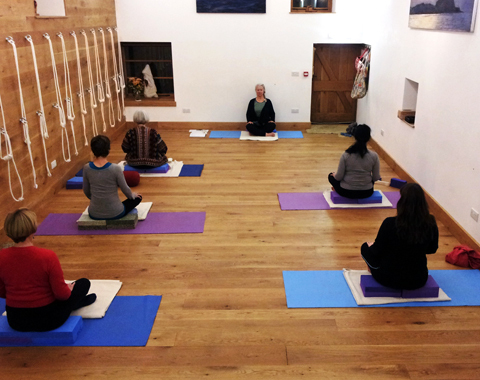 Rowena first discovered Iyengar yoga during her first pregnancy in Bristol, and that baby is now 27 years old! She had done other types of hatha yoga and tai chi before that, but nothing compared with the impact made by a really good Iyengar yoga teacher. After a couple of classes she was hooked! She was taught by Richard Ward for a couple of years and then started teacher training with Kathy Welham. Rowena has found her personal practice a source of steady support through the ups and downs of raising two children, surviving skin cancer and meningitis, and running a successful conflict resolution and facilitation consultancy. 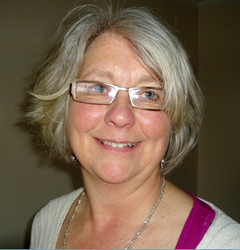 Rowena qualified as a teacher in 1990 and gained an Intermediate Level 1 certificate in 1998. She used to teach at Yoga West in Bristol until moving to Herefordshire five years ago. Despite still working as a consultant, she has been fortunate enough to attend two three-week intensive yoga courses in India and makes sure that she goes on retreat at least once a year and attends teachers workshops to maintain her professional development as a teacher. 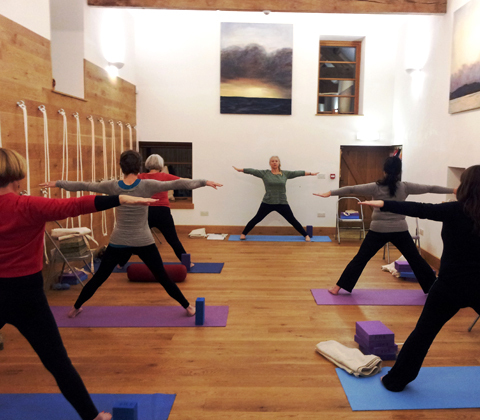 Rowena runs small general classes on Mondays from 6pm-7.30pm and on Thursdays from 8pm–9.30pm. You are welcome to drop in or commit to a term at a cheaper rate. She also runs occasional yoga days at weekends. Please ring or email for further information.